The Lodge: Conferences/Banqueting (40/50); free wi/fi. Rooms 29 (all separate bath & shower, 5 family, 11 ground floor, 1 disabled all no smoking); B&B about €95 pps (see hotel websitefor for current rates). Children welcome (under 2s free in parents' room, cots available free of charge, baby sitting arranged). Lift. Equestrian Centre, Victorian Treatment Rooms. Snaffles Restaurant in The Lodge: Seats 80. Children welcome (high chair, children's menu); D daily 5.30-9.30pm; D €65, also à la carte; house wine from €28; half bottles from €16; wine by the glass from €6.90. Bar food served daily in Conor's Bar, 11am-9pm. The Castle: Rooms 20 (5 master, 15 heritage); 12 seater cinema. Full size snooker table. Afternoon Tea from 2.30pm, €25. Young Diners €8. Open all year except Christmas (24-27 Dec). Amex, MasterCard, Visa. During the three centuries that this extraordinary place has been in the Leslie family it has changed remarkably little - and its fascinating history intrigues guests as much as the unique features of Castle Leslie as they find it today. 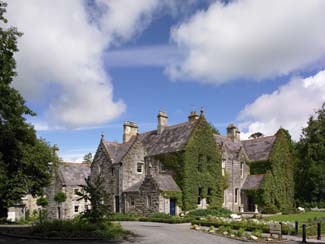 Guests can stay in the Castle (see below) or in the Lodge at Castle Leslie Estate, which is an attractive mainly modern 4* hotel just inside the castle gates. Built around an atmospheric stable courtyard, it is especially popular with riding enthusiasts participating at Castle Leslie’s impressive Equestrian Centre, which offers miles of trekking, cross-country rides and jumps on the 1000-acre estate. 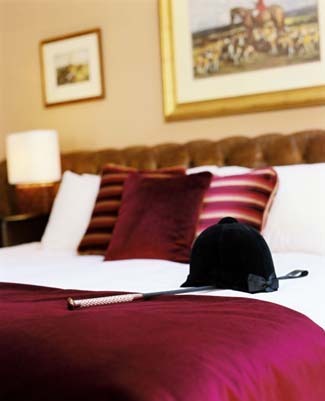 Bedrooms in The Lodge are very much country house, in keeping with the building’s period features. Many have balconies overlooking the courtyards of the equestrian centre. King size beds and free standing Victorian roll-top baths are standard in all rooms while the Junior Jigsaw suite has its own secluded private entrance. The Victorian Treatment Rooms specialise in organic treatments, which are popular for weddings and as an indoor focus for short breaks. 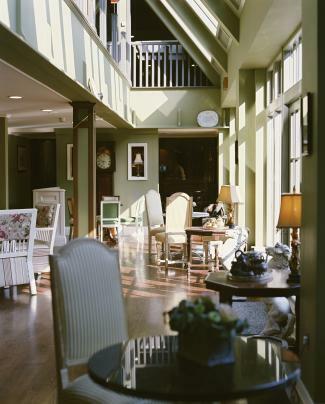 Non-residents are welcome to dine in the hotel’s informal Conors Bar or Snaffles Restaurant. On a mezzanine floor, with windows on both sides, Snaffles is an interesting space with brick walls, polished floor, and a vaulted beamed ceiling - and the 100 or so bottles of gin on the now famous Gin Menu, are cleverly displayed on one wall. Menus featuring old recipes from the Castle Leslie Estate Cook Book express a hearty commitment to supporting local producers and to transparency - a policy statement relating to the use of Irish meats and poultry is given, and also detailed information on suppliers, may of whom operate in Monaghan and the surrounding counties. Less usual ingredients such as quail and rabbit may appear on the starters list, while mains usually include Irish beef and locally produced Silverhill duck. Pork is also popular - perhaps baked pork fillet with braised rib, gratinated lentils with celery and herbs and light spiced baby apple - also loin of lamb, served with beetroot, gherkin, braised tongue and poached quails egg, one from the old cookbook. Desserts are indulgent – chocolate is likely to make two appearances; a hot mousse soufflé and a chocolate box, containing milk chocolate mousse, chocolate crumble and passionfruit cream served with butterscotch sauce. ‘Lighter’ desserts might include lemon cream in filo pastry, with vanilla sponge, frozen yoghurt and lemon meringue tart or daiquiri of strawberry and rum, with strawberry and rum jelly, white chocolate ganache, strawberry sorbet and lime foam. There’s a good selection of house wines, both old and new world, while the main list - which is principally French with a nod to other European countries and New World - includes a limited half bottle selection and wines by the glass.The Gin Menu lists some 100 bottles, eight Irish including the fairly local Shortcross (from County Down) and, from the other end of the country, Dingle Gin. England is the main player with some 40 varieties but Holland, Australia, Spain, Columbia, Norway and the USA make an appearance while Scotland’s offer includes the now very popular Hendrick’s. Breakfast, also served in Snaffles, is delightful. The buffet area has a wide range of breads, pastries, scones and muffins while those who opt to start the day with the Full Irish won’t be disappointed. For casual dining in Conors Bar, tables overlooking the courtyard and the Lodge entrance are popular as this area is bright and cheerful. There is also a series of small rooms, one leading into the other, for those who prefer some privacy - and, with an open fire and traditional pub ambience, this is a cosy option in winter. Tea, coffee and fresh scones are served from 11am with a good range of hot dishes is available from noon. There’s a Young Diners menu (about €8) which, although keenly priced, tends to offer all the usual suspects – breaded chicken fingers, battered cod and panfried sausages, served with salad, chips or mash. Once inside the massive front door (guarded by family dogs who snooze in beds flanking the stone steps) there is no reception desk, just a welcoming oak-panelled hall (and afternoon tea in the drawing room), and there are no television sets or clocks in the rooms, although concessions to the 20th century have been made in the form of generous heating and plentiful hot water. The bedrooms are all different, furnished and decorated around a particular era, with en-suite bathrooms a feature in their own right with huge baths, wacky showers and outrageous toilets, all done in a tongue-in-cheek style, reflecting the family's eccentric history and the wonders of Victorian plumbing. 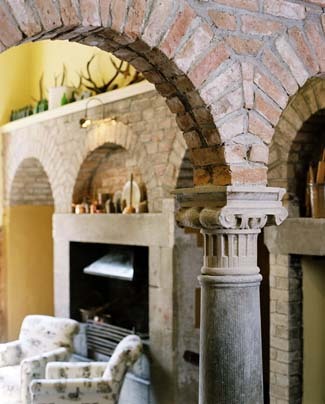 In a charming reverse of circumstances, the family lives in the servants' wing, so guests can enjoy the magnificence of the castle to the full - it has all the original furniture and family portraits. The estate has wonderful walks, and pike fishing; boating and picnic lunches on the estate are available by arrangement. Due to the nature of the castle (and the fact that the Leslies see it as a wonderful refuge from the outside world for adults) this is not a suitable place to bring children. However, children are very welcome at the The Lodge (see above). 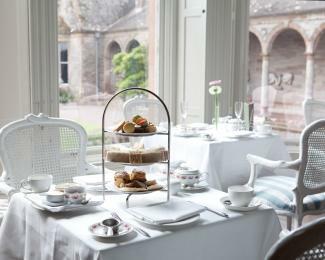 Afternoon Tea is served in the Drawing Room of the Castle and includes such delicacies as cucumber and chive crème fraiche in brioche, crumpets, Irish Cream Liqueur macaroons and opera gateau. Except for Afternoon Tea at the Castle (and breakfast for Castle guests), dining options for residents of both the Lodge and the Castle are the hotel’s informal Conors Bar or Snaffles Restaurant. 10 minutes from Monaghan Town: Monaghan-Armagh road-Glaslough.